The Cumberland & Dumfriesshire Farmers Mart P.L.C. had forward 57 prime cattle, 2 young bulls, 24 over thirty month cattle, 74 prime lambs, 5,234 prime hoggs and 3,555 cast ewes & rams at their weekly sale at Longtown on Thursday 6th May, 2010. Clean cattle lacked overall quality. Top price of 171.5p (£1,174) for a British Blue bullock from Houghton House; Limousin 166.5p (£1,240) Haining House. Charolais heifers to 167.5p Sceughdyke. Heavyweight Charolais bullocks to 160.5p Sceughdyke. Young bulls to 133.5p for Limousin from Gallowberry. A good show of OTM cattle was forward and met a flying trade with bullocks to a top of 153.5p for a Limousin from J. & N. Blaylock & Son, Hallburn. Heifers to 133.5p for a Limousin from G.B. Forster, Desoglin; Charolais 125.5p Desoglin. British Blue cows to 132.5p from R.W. & M. Carruthers, Blacksmiths Cottage, others 111.5p Smallholms, 106.5p Albierigg; Limousin 121.5p, 117.5p Nunscleugh; Simmental 101.5p Copperthorns; Friesian 93.5p The Stubb. Top per head of £914.25 from British Blue from Blacksmiths Cottage, £880.85 Smallholms; Limousin £908.85 Smallholms, £789.75 Nunscleugh. Included in the sale was The Annual Spring Show & Sale of prime lambs. A total of 74 were present, meeting a good trade, to average out at 220p per kilo or £98.76 per head. Top price paid was £112 for the Champion Single lamb from Hazel Martindale, The Lands and bought by the judge, Mr Andrew Dawson. Pairs – 1st prize – Land Farm, 46 kilo Suffolk lamb sold at £108 to the judge. 2nd prize – Calf Park, 45 kilo Suffolk lamb sold at £99 to the judge. 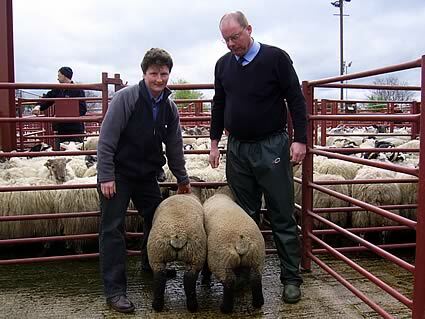 Singles – 1st prize – Land Farm, 49 kilo Suffolk lambs sold at £112 to the judge. 2nd prize – Fowrass, 50 kilo Charollais lambs sold at £105 to the judge. A larger show of 5,234 prime hoggs saw trade keep up with recent high rates to level out 190.5p per kilo. Light hoggs were easily sold and short of buyers requirements, good export types were again keenly sought after. Top per kilo of 257p for Beltex’s from Mouldy Hills and to £118 per head for Texels from Kirkton, others £116 and £106 also from Kirkton; Beltex £106.50 Ainstable Hall, £105.50 Mouldy Hills, £96.50 Ainstable Hall; Hill Cheviot £94.80 Wanwood Hill, £91.20 Wicket Thorn; Suffolk £93.80 Balgracie, £90.50 Newington; Blackface £92.50, £89.80, £87.80 Smalmstown; Charollais £89.80 Hallburn, £83.50 Golden Lane; North Country Cheviot £86.80 Carruthers, £85.80, £82.20 Sockbridge Hall; Half Bred £85.50 Broomhill Bank, £84.80 Butterdales; Greyface £85.50 Newbigging, £84.80 Sockbridge Hall and Butterdales; Swaledale £76.80, £72.80, £66.50 Milescott; Lleyn £83.80 Netherhirst; Vendeen £74 Kirkwood Mains; Leicester £70 Old Police House. The 1,014 lightweight hoggs sold to a top of £76.80 for Hill Cheviots from Newington, £63.80 Laythes; Texel £73.50 Golden Lane, £70 Powheads; Greyface £72.80 Golden Lane, £63.80 Newtown; Lleyn £70.80 Netherhirst; Vendeen £70.50 Newtown; Beltex £70 Mouldy Hills; Blackface £68.80 Newington, £67.80 Balgracie and Sockbridge Hall; North Country Cheviot £68.80 Almagill, £68.20 Sockbridge Hall; Suffolk £67.80 Carpet Farm, £61.80 Sockbridge Hall; Herdwick £66.80 Johnstone Bank; Shetland £64.80 Almagill; Swaledale £58.50 Prior Rigg; Jacob £54.80 Sockbridge Hall. A larger show of 3,555 cast ewes and rams sold to a larger than usual ring of buyers. Trade was similar on the week with all types keenly sought after. Top price of £158.50 for a North Country Cheviot ram from Rashee, others £116.50 Clackmae; Charollais £143.50 Rashee and Roadside; Suffolk £138.50 Boreland, £128.50 Clackmae; Texel £136.50 Batey Shield, £129.50 Coytre; Beltex £120 Ainstable Hall; Leicester £118.50 Clackmae; Hill Cheviot £108.50 Rashee; Blackface £86.50 Holm of Daltallochan, £76.50 Maidencoates; Ryeland £72.50 Shoestanes. Heavy ewes to £150.50 for Leicesters from Old Police House and Greyfaces from Maidencoates, other Leicesters £118.50 Hole of Lyne and other Greyface £136.50 Muirhead; Suffolk £140.50 Land Farm, £132.50 Fossway; Charollais £133.50 Severs, £130.50 Rashee; Texel £129.50 Loughrigg and Burnside, £126.50 Seavers; North Country Cheviot £112.50 Seavers, £94.50 Nether Stenries; Beltex £100.50 Ainstable Hall; Zwartbles £94.50 Rashee; Cheviot Mule £90.50 Clackmae, £78.50 Golden Lane; Half Bred £87.50 Hoddamtown; Romney Marsh £85.50 Sockbridge Hall; Bleu d’Maine £83.50 Seavers; Dorset £81.50 Seavers. Hill ewes to £88.50 for Lleyns from Redding Farm and Millside; Blackface £79.50 Seavers, £72.50 Harsondale; Cheviot £77.50 Stackbraes and Graystale, £65.50 Alton; Swaledale £74.50 Reaygarth, £69.50 Westhills and Nunscleugh; Shetland £65.50 Alton; Jacob £46.50 Turnbank; Herdwick £34.50 Laalsteins.